ANOTHER BEAUTIFUL “J” MONOGRAMMED HANKY! IT’S WHITE ON WHITE, MEASURES 12” X 12”, AND IS IN EXCELLENT CONDITION. THIS IS A FANCY “L” MONOGRAMMED HANKY! IT’S WHITE WITH A FLOWING “L” MONOGRAM, VINES, AND FLOWER STITCHED IN BLUE AND IT HAS A CROCHET EDGE IN VARIEGATED BLUE. MEASURES 13” X 13 ¼” AND IS IN EXCELLENT CONDITION. THIS IS A GORGEOUS HANDKERCHIEF! THIS IS A LOVELY MONOGRAMMED HANKY FOR ELEANOR! HANKY IS WHITE WITH ELEANOR AND FLOWERS STITCHED IN BLUE. MEASURES 13 3/4” X 14” AND IS IN EXCELLENT CONDITION. VERY PRETTY MONOGRAM HANKY FOR ANNA! 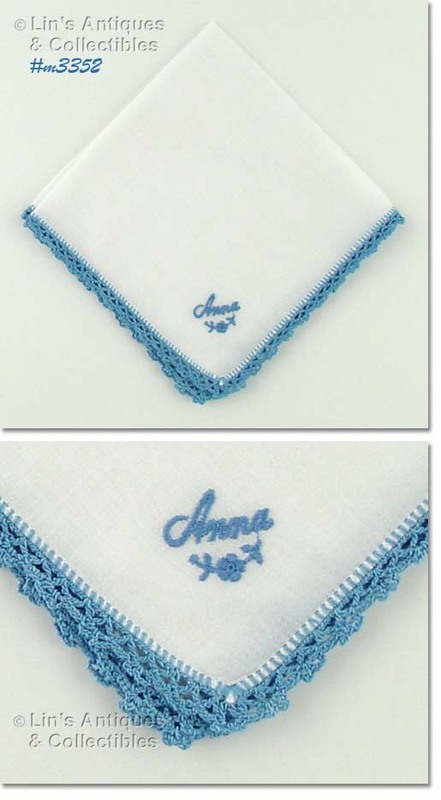 HANDKERCHIEF IS WHITE WITH “ANNA” IN BLUE AND IT HAS A BLUE CROCHET EDGE. MEASURES 10 ¾” X 10 ¾” AND IS IN EXCELLENT CONDITION. THIS IS A PRETTY HANKY! IT’S WHITE WITH A LARGE “L” MONOGRAM – ALSO IN WHITE. HANKY MEASURES 16” X 16 ½”. 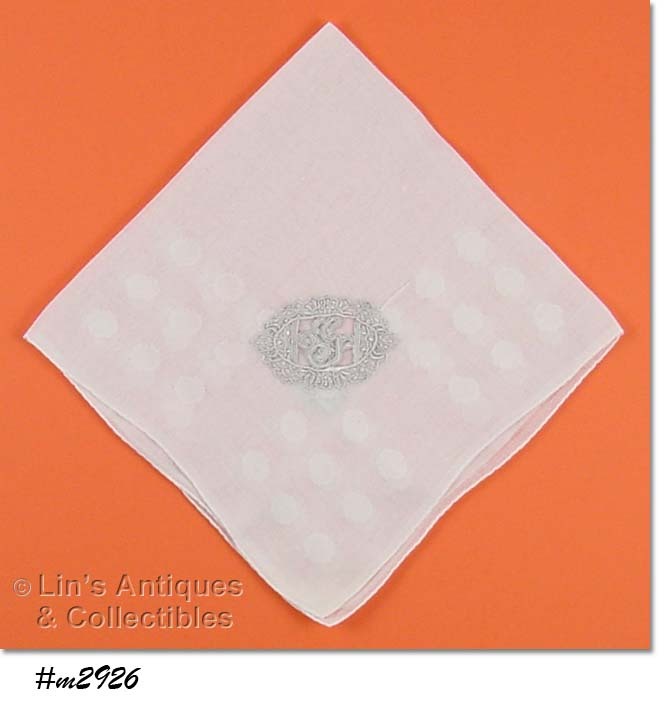 BEAUTIFUL PINK “G” MONOGRAMMED MADEIRA HANDKERCHIEF! MEASURES 12 ¾” X 13 AND IS IN EXCELLENT CONDITION. 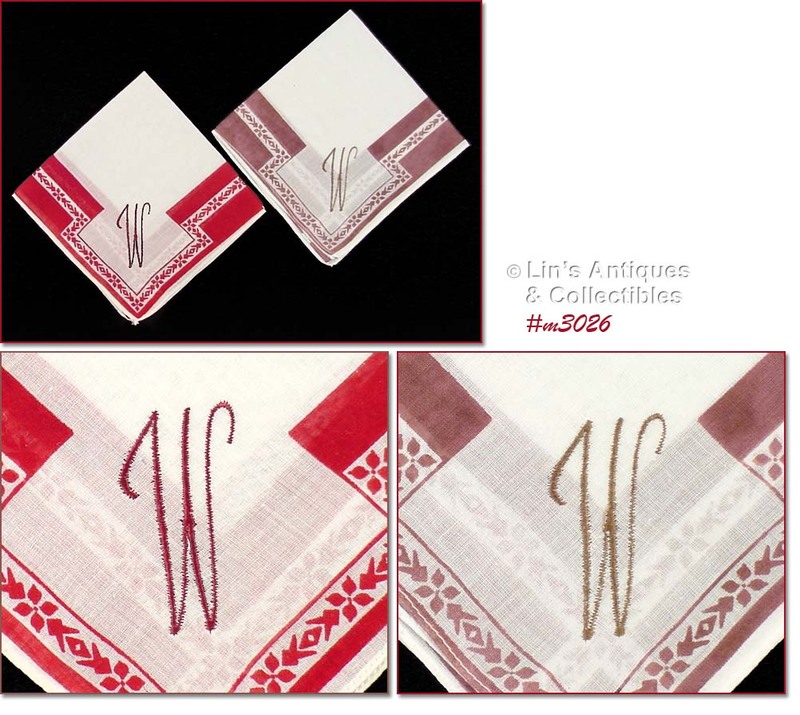 FINE LINEN HANDKERCHIEF WITH A LOVELY “D” MONOGRAM AS THE ONLY ORNAMENTATION! HANKY MEASURES 11 ½” X 11 ½”. ELEGANT SIMPLICITY! THIS IS A BEAUTIFUL WHITE HANKY WITH A FANCY “F” MONOGRAM! HANKY MEASURES 11” X 11 ¼” AND IS IN EXCELLENT CONDITION. THIS IS AN ELEGANT MONOGRAM MADEIRA HANKY! IT MEASURES 12 ¾” X 13” AND HAS A PRETTY “T” MONOGRAM ACCENTED WITH SMALL FLOWERS. EXCELLENT CONDITION! 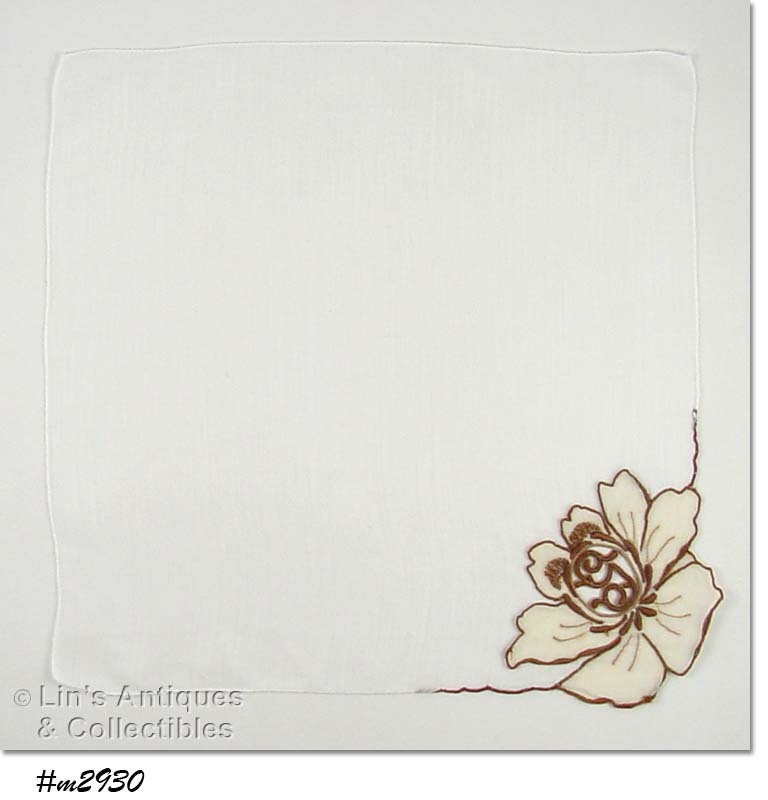 THIS LISTING HAS A GORGEOUS WHITE HANKY WITH “PAULINE” IN WHITE! MEASURES 11 ¼” X 11” AND IS IN EXCELLENT CONDITION. THESE MONOGRAM HANDKERCHIEFS ARE SO PRETTY! THERE ARE TWO IN THE LISTING, ONE IS RED AND THE OTHER IS BROWN. HANKIES MEASURE 12 ¼” X 12” AND ARE IN EXCELLENT CONDITION! THIS IS A LOVELY MADEIRA HANDKERCHIEF! IT’S WHITE WITH “G” MONOGRAM IN GRAY ACCENTED WITH GRAY FLOWERS. THERE ARE ALSO GRAY FLOWERS IN EACH CORNER. MEASURES 12 ½” X 12 ¾” AND IS IN EXCELLENT CONDITION. 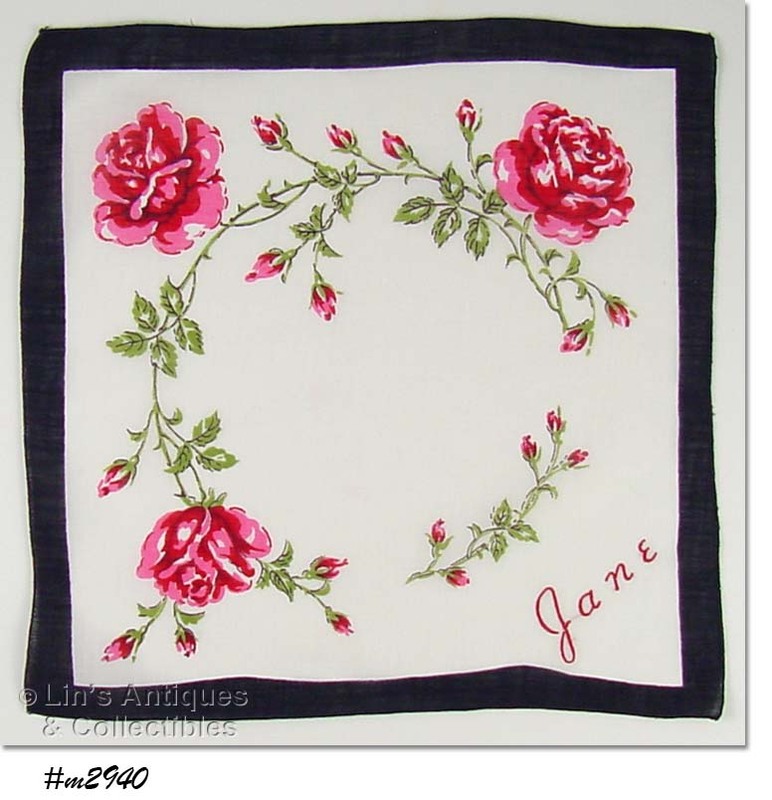 LOVELY PINK ROSES ON THIS HANKY MONOGRAMMED FOR JANE! MEASURES 11 ¼” X 11 ½” AND IS IN EXCELLENT CONDITION. 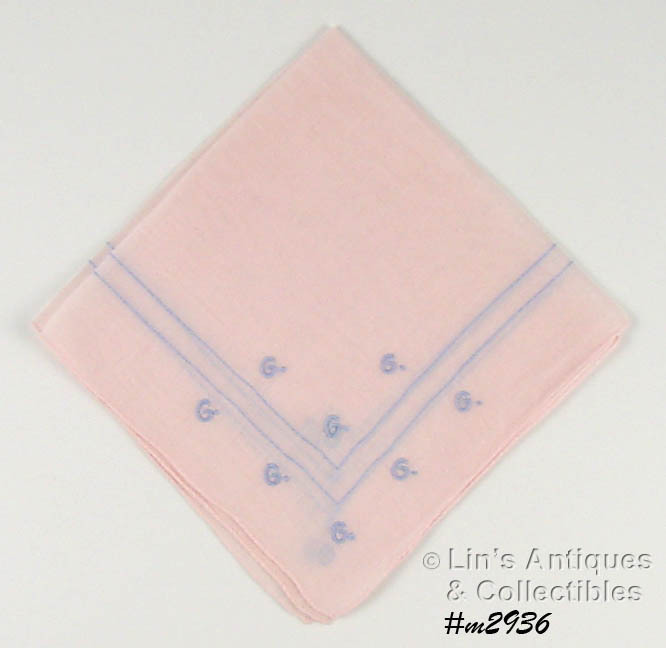 THIS IS A SOMEWHAT UNUSUAL MONOGRAM HANKY – IT’S PALE PINK AND HAS BLUE “G” MONOGRAM! THERE ARE “G” MONOGRAMS IN EACH CORNER – EIGHT IN ONE AND EACH OF THE OTHER CORNERS HAS TWO. HANKY MEASURES 11 ¾” X 12” AND IS IN EXCELLENT CONDITION. THIS IS A VERY PRETTY HANDKERCHIEF! IT’S WHITE WITH “M” MONOGRAM AND ROSES IN VARIEGATED PINKS. HANKY MEASURES 13 ½” X 13 ½” AND IS IN EXCELLENT CONDITION. THIS LISTING HAS TWO “N” MONOGRAMMED HANKIES! 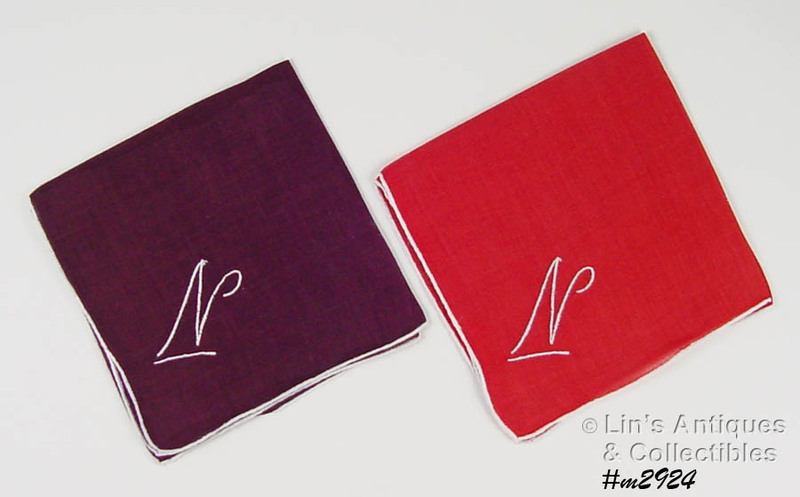 ONE HANKY IS RED, THE OTHER IS BURGUNDY COLOR, BOTH HAVE WHITE EDGING/HEM, AND A WHITE “N” MONOGRAM. MEASURE 11 ¾” X 11 ¾” AND ARE IN EXCELLENT CONDITION.